I do so love The Terminator. I’m actually watching it as I type this review. Not only is it ’80s low-budget cinema at its best, but it somehow manages to involve a lot of deep sci-fi elements grounded in semi-reality, while also being super-cool. And Arnold’s puppet heads. C’mon, who doesn’t love a jerky Arnold puppet head? I would probably have reviewed every single Terminator-based game by now, if I didn’t believe that I should space them out for those who don’t quite think the film is the bees’ knees. And I’m well aware that the site is not called Just Terminator Games. There’s something else I enjoy equally, and that is providing comprehensive reviews for games that do not appear to have any available online. In this case, you might have already heard of Bethesda’s original version of The Terminator as a unique, groundbreaking, free-roaming title. You may have also heard of this credited as an early Grand Theft Auto. These are the very points that interested me, and I threw down $25 to bring this in from Australia (thanks Cheryl!) to answer them definitively for current and future robot-persecuted generations. The Terminator is indeed an interesting “sandbox” title. It takes the fundamental match-up from the film – Michael Biehn’s hardened, but human, Reece against Schwarzenegger’s unstoppable Terminator, and throws the two of you into a non-linear world with Sarah Connor hanging in the balance. You choose to play as either Reece or the Terminator, and battle it out in a digital rendition of nearly 60 square miles(!!) of central Los Angeles. It’s quite an accomplishment for 1991, and for a game written entirely in assembly language. Innocent bystanders mill about around you, stores open and close, residential areas transition into high rises, and there’s even LA landmarks like Griffith Park and Dodger Stadium. It’s certainly ambitious, and the sandbox city generally (though not always technically) works as described. When you start as either character, you will appear randomly somewhere in the gameworld. A potentially amusing search for clothing is omitted, but otherwise, you have no items and no weapons. Your adversary has spawned somewhere else under the same conditions. It is then a race between the two of you to load up on weapons, defeat the other, and find Sarah Connor as the Terminator, or defend her as Reece. The finding of weapons and equipment is easy enough, as you are provided detailed maps both in-game and out. Pressing P will open a phone book which lists nearby stores and their map coordinates. A large, gridded map is provided in the box, and mimicked without numbers or street names by pressing Alt-M. The area around you will be marked by a red box. Pressing just M will display a close-up of that red area, with corresponding grid numbers and nearby stores marked by color-coded dots. The Terminator has additional access to his current coordinates and heading on his HUD, though these maps will be useful to either character. Once you have a location in mind, you can opt to set a marker on the map screen and be guided to that position by indicators on your HUD. You can also elect to “fast travel” to any point on the map while the appropriate time is deducted. Your opponent is still actively arming himself or searching for you during this time, and your travel can be interrupted by hostile police or opponent intervention. Your other method of getting around is to break into a car and drive at much faster speeds than you could manage on foot. Cars are also appropriately useful for getaways, and other situations where your fast travel ability is negated by nearby foes. They have their own damage meters, and will injure you if they are damaged to the point of blowing up, or if you crash. They can also run out of gas, forcing you to buy more at a service station, or simply steal a new vehicle. These cars will be randomly either manual or automatic transmission, though there is no immediate or apparent benefit to driving a stick. But I suppose that while cops are swarming around you and you’re taking bullets, it won’t matter all that much. It would thus be a good idea to know the keys to control either type. 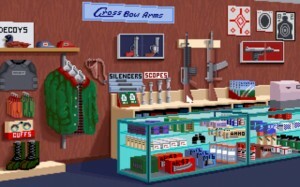 The stores you can patronize are gun shops, pharmacies, sports stores, gun ranges, and banks. Many are filled with bogus items that will simply take up space in your inventory and slow you down, but you will find useful items in all stores, and few surprises about what you will and will not need (a duck call and insect repellent you will not need). 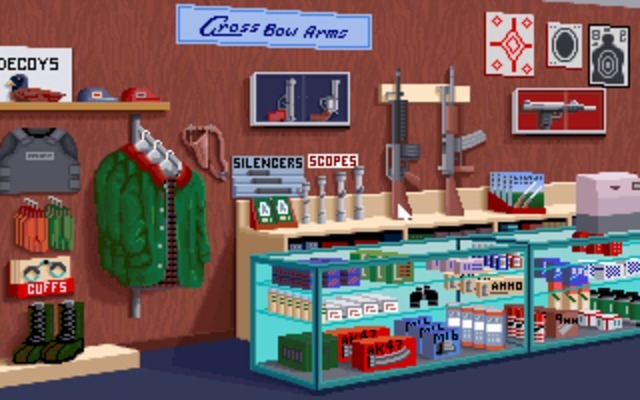 The gun shop should be obvious, the pharmacy holds items that will speed healing, and the sports store primarily has a compass that’s useful for Reece to get his bearings. In all of these stores, you can elect to purchase or steal items. As you have no money, the choice should be obvious. Stealing, however, will cause that store to close after you leave, and will get you in trouble with the law. In fact, if you stand around stealing item after item, you’ll give the police time to arrive outside. Fortunately, you can never be arrested. Unfortunately, the police come out shooting no matter how petty your crime. There’s no visible “wanted” meter like in GTA, and the police won’t actually chase you, so it’s difficult to gauge the true impact of your actions on the police presence. If you get caught in a shootout with cops or your opponent, more cops will certainly appear. If you’ve done anything illegal, then your likelihood of fast travel interruptions increase as police “spot” you, which forces you to drive or walk everywhere. The alternative to this is to locate a bank so you can pay for items with cash. You can rob a bank for lots of money, which won’t really help you avoid the police, or you can elect to “withdraw” a randomly determined amount. I presume you’re getting a loan, and having Arnold monosyllabically request low-interest APR is an amusing image. The catch is that banks are few and frequently closed. You cannot “wait” outside a building, so you can expect to have to travel to many banks before you find an open one. Its up to you to decide if you have that kind of time. You will also be attracting the attention of the police eventually, through all the various gunbattles you will have with your opponent. This is the groundwork, and I started having some pretty cool ideas and expectations as I read through this stuff in the manual. Yet one question kept coming back to my mind – how do you find Sarah Connor? There’s no ability for investigation like there was in the film; you can’t show up at her job, you can’t track her down in the phone book… so how do you find her? Simple. Both characters have a tracker that aims a green line in whatever direction she currently is. 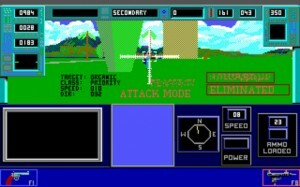 Playing from the Terminator’s viewpoint gives a computerized HUD. I thought this was going to be extraordinarily lame, but it probably is better than the alternative of searching endless block after endless block. I was also concerned that this would ruin the length of the game, but this is not so. Just because you know where your target is, doesn’t mean you’re ready for them. As Reece, just because you start with Sarah doesn’t mean either of you are any safer. You will have to spend just as much time as the Terminator in preparation for his arrival. Luckily, Sarah is not dead weight. You can order her to follow using a command menu called up by the Q key. She will thus travel with you everywhere, including in cars and fast travel. If you order to her to stay (as you go off Terminator-hunting, for example) or run away (if the Terminator ambushes you both) you can find her again using the green line tracker. She can even carry and hand over items like extra ammo or guns, though she cannot use them herself. I was also amazed at how quickly damage could add up. I stormed in my first time as the Terminator, and through a combination of Reece’s weapons and the cops attracted by the gunfire, I was blinded after a couple minutes of fighting and no particular progress. I tried to stumble away, but the cops gunned me down as Reece absconded. I initially shrugged off the drug stores and rest cycles, but quickly found after being quickly blinded with both characters that pressing an attack rarely works in your favor, and retreat or escape actually becomes a very good idea. This is a face-off that’s meant to last, after all. This need for flight is magnified by the game’s RPG-like “rest” system of healing. You can never enter a building or truly pigeon away from your enemies, but you can find a relatively quiet spot and try to heal the various parts of your body. Damage to these areas have obvious detrimental effects; head damage blinds you, leg damage slows you down, etc. Inventory items taken from drug stores help to speed this healing. Yet just like the fast travel, your rest can and will be interrupted by cops on patrol, or the arrival of your opponent. This menu also has a very simple line graph representation of your total health versus your opponent’s total health, useful in knowing when to attack. Sarah also has no health meter for herself, and it would appear that she cannot be healed, or heals on her own at an unknown rate. 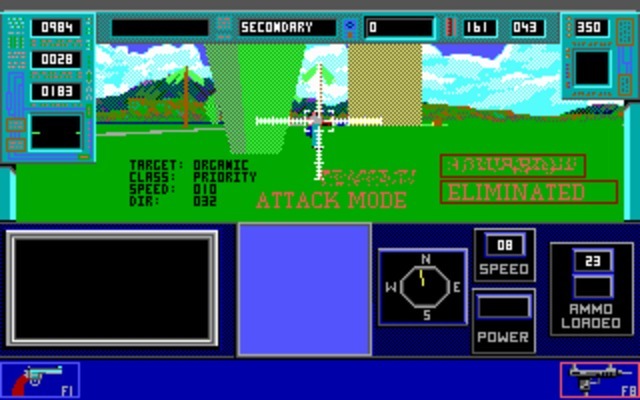 For what is essentially a FPS, the controls are much more like a flight sim. A reference card covers the various keys and key combos, handling everything from which way your character is looking, to fine-tuning your aiming crosshair. You will not need most of these to play the game, and many of the view options end up in more confusion than actual help. Guns are assigned to the function keys, and pressing one will draw it. The police respond appropriately to drawn weapons, so pressing Ctrl and that function key will put it away. The Shift key acts as a modifier to speed any action up, turning, walking, steering, accelerating – anything at all, and is really the only lifesaving key on the board. Here, I’m doing a particularly bad job of protecting Sarah from The Terminator. The early 3-D engine is much more of a technical achievement than a graphical one. An impressively large area of central LA has been carved out – from Mulholland Drive to National Blvd, and from Beverly Drive to Central Ave, but the buildings within are all generic and made of flat, monochrome polygons. The streets appear to have been authentically recreated in their layout, but your cars gain no more benefit from driving on them than from aiming at the green tracker line and gunning the engine across grass. The speed of the game engine is decent for the time, probably 15-20 FPS, but slows to about 5 if many buildings or objects are on the screen at one time, or often for no apparent reason at all. There’s a lot of polygon tearing and disappearing, as well as a fair amount of graphical bugs in general. There’s also nothing about the gameworld to really make it clear you’re in Los Angeles, aside from the occasional, obscurely-rendered landmark. It’s playable, but awfully dated. Reece and Sarah cannot hide or escape the city, so the only way either character can win is to kill the other. Unfortunately, it never quite seems like the epic confrontation its supposed to be. Part of the blame for this falls on the AI. Though your opponent does appear to stockpile weapons, they cannot use vehicles, so there will be no chase scenes. It’s fairly easy to avoid them when they cannot drive, though they will still catch up with you surprisingly quickly if you try to rest. From the other perspective, your quarry always travels on foot, so they can’t get very far if you were to lose them. Cops just sort of appear without any verifiable explanation, and they always shoot at you, never at your opponent. It’s also far more difficult than it should be to aim at your foe – cops often stand still and are easy targets, but your opponent will run back and forth while seemingly having perfect aim the entire time. Still, it’s an awesome concept, and a neat departure from the typical movie-licensed game. It doesn’t work as well as it could, or as you might like, but it does work. 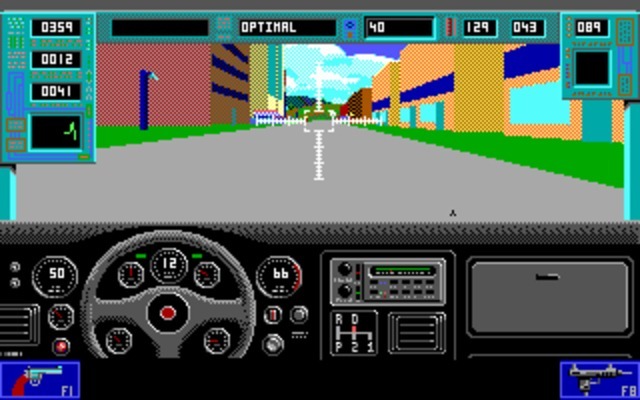 It seems unfair to call it an early Grand Theft Auto, as there’s not really enough focus on wandering around the city and making use of it. You certainly can, but exploration will be your only reward from deviating from the central match-up. This game would have had much more lasting appeal when it was released, and when it really was a revolutionary concept, but it’s hard to recommend a purchase now. However, if you get the opportunity to check it out, and can get it running properly, there are worse ways to spend a couple hours. Roughly 10 mile by 6 mile recreation of LA with 1991 home technology. Very cool way to use ideas from the film. A little too early for this kind of game, and the engine is functional, but not supportive of the gameplay. Basic AI limits your allegedly deadly opponents to running back and forth while shooting. Can you tell me how to proporly install this great game into dosbox, without crashes. I recently have been given this game by a friend, and I really want to play it now. You’re looking for a GAME.EXE download link posted by “wd”. This will fix an obsolete prefetch call and should make the game playable on DosBox. For what it’s worth, I don’t remember having to do this, but it was six years ago. Regardless, the Vogons chaps are ultra reliable. You will also need the original code card to get past the copy protection check. It’s a red card with a grid of symbols. Hey can you help me I can’t play this because I don’tknow the controls can anyone show me a site for the controls? F1-F8 select a weapon. Adding Alt reloads the weapon. Adding Ctrl holsters it. Enter or Tab fire. Space + arrow keys move the aiming cursor. X locks a target. F is fast travel. M is local map. Alt+M is full map. P is phone book. S enters a nearby store. E enters a car. S starts the car. Arrows control the car. The Insert through Page Down key cluster controls the gears (So Insert is 1st gear, Delete is 2nd, etc.) Backspace is the clutch. W to leave the car. R (I think) is rest. Use the first letter of the part you want to heal with medkits, so (H)ead, (T)orso, (A)rms, (L)egs. Those are the critical controls. Do you know where to download this from? also, any idea where to find a physical map of this game world, like the maps that come with skyrim and oblivion?